Dhaka, 10 October, Abnews: Have you ever seen a shooting star? No, not a micrometeorite flaring to a crisp in Earth's atmosphere — an actual star, careening out of its orbit at millions of miles an hour on a hell-bent journey to blow this pop stand of a galaxy and enter intergalactic space. Astronomers call them "hypervelocity stars," and they represent the fastest-moving stars in our galaxy. These rogue stars move so speedily that they are gravitationally unbound from the Milky Way; instead of orbiting the galaxy's center like our sun and billions of others do, many hypervelocity stars seem to blaze forward on an unstoppable path out of the Milky Way entirely. Some may end up drifting aimlessly through intergalactic space. Others might one day plunge through the hearts of distant, alien galaxies like cosmic expats. 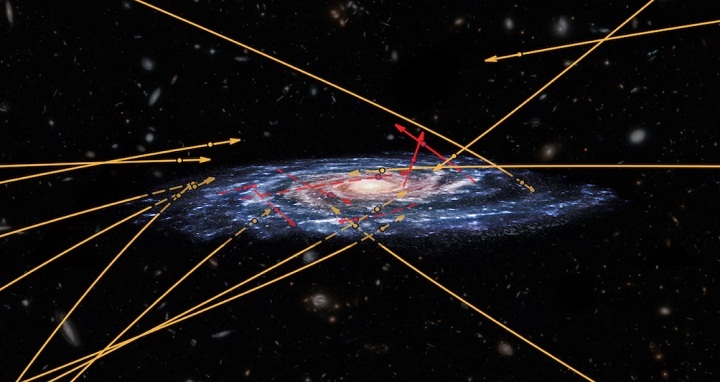 "Rather than flying away from the Galactic center, most of the high velocity stars we spotted seem to be racing towards it," study co-author Tommaso Marchetti, a researcher at Leiden Observatory, said in a statement. "These could be stars from another galaxy, zooming right through the Milky Way." Marchetti and his colleagues identified these potential interstellar interlopers while poring over position and velocity data for more than 7 million Milky Way stars, provided earlier this year by the European Space Agency's Gaia satellite. While scanning the skies specifically for the galaxy's fastest stars, the researchers found 20 previously undiscovered stars that could be traveling untethered from the galaxy's gravity. Seven of these stars appear to be "hyper-runaways," the team wrote, apparently originating from the Milky Way's galactic disc and speeding outward toward intergalactic space. The remaining 13 stars seem to be moving on a trajectory that makes it unlikely they ever intersected with the galaxy's massive disc at all. More likely, the researchers wrote, these alien stars originated from a nearby galaxy such as the Large Magellanic Cloud (a satellite galaxy of the Milky Way, roughly one-hundredth the size of ours) and somehow got punted into our corner of the universe long ago. How does a star get kicked so far and fast out of its orbit in the first place? Astronomers think it has something to do with binary star systems (a pair of stars that revolve around each other, or around a common focal point). If one star in a binary pair were to disappear — say, if it got sucked into a supermassive black hole or reached the end of its life span and exploded in a supernova — astronomers think the resulting gravitational disruption could be big enough to kick that star's partner fantastically out of orbit. "Either way, studying them could tell us more about these kinds of processes in nearby galaxies," study co-author Elena Rossi, a theoretical physicist at Leiden Observatory, said in the statement. As of 2017, astronomers had only observed about 20 hypervelocity stars directly, even though their models estimated that there could be 10,000 or more of them whizzing around our galaxy. This new study provides fresh evidence that a galaxy not-so-far, far away may be pouring stars into ours — and, through those stellar messengers, we might get to know our neighbors a little better. - Live Science.